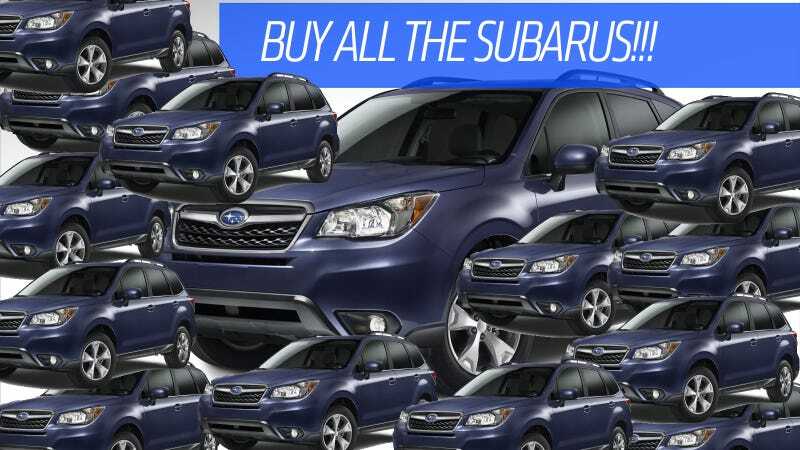 Like a Franklin Terrace dope fiend jonesin' for those WMDs, Americans are thoroughly addicted to buying new Subarus. Subaru just recorded its best sales month of all time in August, and that's on top of an insane record-breaking sales streak that has lasted well over a year. How did we get so hooked on Subaru? New car sales have been on the upswing in recent months as the economy improves, and Subaru has been way out in front. As USA Today notes, Subaru in August sold nearly 42,000 vehicles, a stunning 45 percent increase over the same month last year. The redesigned Forester's sales were up 89 percent, and sales of the WRX — which has been around in its current form since 2007 and soldiers on unchanged for 2014 except for a price increase — were up 45 percent over last August. Usually, performance cars that long in the tooth start to lag in sales as they get older. Not so with with the WRX, which has proven to be as unstoppable as the newer cars in the Subaru family. And while enthusiasts like you and me are a tiny minority in the car-buying market, even the BRZ is selling well. Subaru moved 868 of them last month, a staggering 155 percent increase over August 2012. (It went on sale in April 2012, and Subaru struggled to keep pace with demand for them last year.) Many of those buyers are younger people, too. Who says the Millennials don't buy cool cars? So far this year Subaru has sold close to 282,000 cars. In the grand scheme of things, that's not even really that much. Toyota anticipates selling 330,000 2014 Corollas alone next year. But for Subaru, a small, semi-independent and scrappy automaker that lacks the extensive lineup of its bigger rivals, these numbers are pretty darn incredible. It's been the same story for months now. Each time new sales figures are released, the company sets new records. In some ways, it's even become a problem for them. As the Wall Street Journal noted in mid-August, they've been so blitzed by their own popularity that they are now dealing with shortages across the board, leading to questions about their ability to expand as a company. The way that Subaru was blindsided by its own U.S. success has been a cause of embarrassment for [Subaru of America Chairman Takeshi] Tachimori. He said the company's sales projections were so conservative that he found himself apologizing instead of complaining to production officials for the shortages. This missed opportunity has caused Mr. Tachimori, who previously led development the Subaru Outback and Legacy, to push other executives to soften its play-it-safe approach. It's a good problem to have, isn't it? But when you glance at Subaru's lineup, this kind of success really shouldn't be the case. As I said before, they lack the wide selection of cars like their bigger rivals Toyota, Chevrolet, Nissan and even Hyundai. Subaru doesn't have a minivan. They don't have a true large SUV (the Tribeca doesn't really count, and it's the one oddball in the lineup that isn't selling.) They don't have a subcompact car. They don't have any trucks. They also only offer one hybrid car, and none of them are really all that fantastic in terms of fuel economy. They don't have any premium or luxury vehicles. And if I can get a little mean for a moment, besides the BRZ, none of the cars in the Subaru lineup are really all that great-looking. Hyundai's cars are infinitely more attractive. So how the hell is Subaru doing so well? It's because they're tops in the places where mainstream new car buyers look for advice on cars to buy. Pretend, for a second, that you're not a Jalop. (I know, it's terrifying. Stick with me.) You need a new car but you don't know much about cars, and the buying process scares you. But you're smart enough to do some research rather than just go out and buy a Civic or Camry or whatever by default, so where do you turn? That's right — Consumer Reports. And Consumer Reports loves them some Subaru. This year the magazine ranked Subaru at the top of their report cards, heaping praise on the Impreza, Legacy, Outback and BRZ. The redesigned 2014 Forester recently took home the top small SUV rating. Say what you want about Consumer Reports, but their tests hold tremendous sway over the car-buying public. But it's not just CR. Last year ALG named Subaru tops for retaining their value, and they're also killing it in the crash tests with the IIHS naming all their cars as top safety picks. In other words, they have earned all the right accolades from all the right people. I'd also add that most of Subaru's cars are about in that magical $20,000 to $30,000 range that is pretty ideal for so many new car buyers. On top of that, they offer all-wheel drive, which as we all know is hardly needed in most areas of the country but does offer an imaginary extra layer of protection for people who are afraid they'll run into rainstorms on their way to the grocery store. So there it is. Right now Subaru is in that sweet spot where they have all the stuff mainstream buyers want — safety, quality, and low cost — and the people whom those buyers trust have nice things to say about their cars. No wonder they're doing so well. This is actually a great thing for people like you and me. Subaru makes two of our favorite cars, the BRZ (and they also manufacture its Toyota/Scion twin) and the WRX. They even have an all-new 'Rex in the pipeline, and they still make wagons and hatchbacks with manual gearboxes. They love to go racing, too, specifically on things other than pavement. If more sales helps to fund all those things, it's great news. Right now Subaru has managed to capture both the mainstream audience and the enthusiast one, and that's not easy to do. Now we need to see if they can ramp up production to keep up with demand and grow from being a niche brand without losing their essential Subaru-ness. Some have accused Subaru of losing their character as they have grown. I can't say I've really seen it all that much. If they have it's not nearly on the level of BMW or Honda, for example. I'll get worried when they stop making competent all-wheel drive cars with turbo Boxer engines that can handle anything you throw at them. Until then, it seems like Subaru has nowhere to go but up.